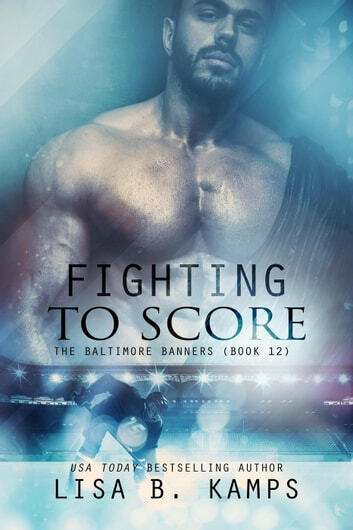 Shane Masters has it all: a promising career with the Baltimore Banners, a big house, fast cars, financial security, and—up until a month ago—the woman of his dreams. Now he's floundering, with no idea what he did wrong and no idea how to win her back. To make matters worse, her brother—Shane's former best friend—shows up and decides to get involved. Chloe Hunter has never run from a challenge in her life—until the weekend she visits Shane in Baltimore and realizes he isn't exactly the same man she fell in love with all those years ago. He's too accustomed to getting what he wants and Chloe refuses to be just another prize for the taking. That doesn't mean she's giving up, not yet. This is book #12, in the Baltimore Banners series. This book can be read as a standalone novel. For complete understanding of the series, and to avoid spoilers also, I recommend reading this series in order. Chloe is running scared. She got together over the holidays with the love of her life. Can she trust him not to break her heart, again? Shane has always been in love with just one woman. He thinks all is well after they reconnect over Christmas. Then she disappears again. Is it possible to fix what you never knew was broken? These characters were really something. I almost put the book down. There was a lot of angsty pieces. I am so glad I read to the finish line. This couple was so meant to be. I found it to be right on for this series. ***This early copy was given in exchange for an honest review. First of all I have to say if you didn't read the Christmas short Christmas Interference stop and go back and read it. I'll admit I didn't, nor did I really want to. While you don't have to read it, you might get a better feel on this story if you do. With that being sad, I enjoyed this book. I'll be up front and admit that I wasn't a very big fan of Chloe though. She knew she loved Shane but she couldn't figure out completely what was making her freak out. She just kept being evasive and either telling both Shane and her brother Wyatt that she either didn't know or that nothing was wrong. After awhile it got annoying. Shane seemed like a decent guy, even with his regrets. He kept going after what he wanted, no matter how often Chloe pushed him away. All in all I thought this was an enjoyable book. I loved "Christmas Interference" so I was glad to read this continuation of Chloe and Shane's story. I love these two characters! I did think Chloe acted a little immature with her actions. I think Wyatt nailed it by stating she was acting like a two year old. Lot's of drama in this one. I am glad that Wyatt, Chloe and Shane got over the past and were finally able to more forward. This is a wonderful and well written story and a great addition to the "Baltimore Banners". Kamps puts it all on the line and scores a goal. Figuring out the heart is much easier when you have your head on straight. Fighting to Score is about listening to your head without drowning out your heart. For Shane and Chloe, young love has become adult confusion. What once felt perfect is quickly becoming a mess. Can two broken hearts find their way back to becoming one? Kamps puts it all on the line and scores a goal. 3.5 stars — I was really excited about this book after reading the prequel story “Christmas Interference” in the Hockey Holidays anthology. I experienced a lot of feels in that short story, and I connected with both Shane and Chloe. But the Shane and Chloe at the end of that story were a LONG WAYS OFF the Shane and Chloe we see in this story. In the end this one didn’t really deliver what I was hoping for. First things first, I think NOT reading the prequel first might leave you a bit confused…or at least somewhat unfulfilled. I can’t imagine not having read it first, I even went back and skimmed the ending before starting this one. So, on to this story. Quite honestly, I didn’t really like our main characters in this story, but especially Chloe. She was wishy washy, evasive for reasons that I never fully comprehended, and I felt like she yanked Shane around (even if unintentionally). And the author employed the “keep the reader in the dark” technique in this book, and I am NOT a fan of that. Like Chloe would start thinking about something, some reasons for why she was evasive with her family or ignoring Shane, and then she would say “but I’m not ready to think about that.” Or something like that anyways. She did it multiple times, and that kind of thing just drives me nuts as a reader. It’s a personal taste thing, but I just can never understand the purpose of employing that literary technique, except to perhaps manufacture mystery or something. But if the character knows, and keeps almost bringing it up, I feel toyed with. Makes Lenore a cranky reader. So that probably didn’t help my feelings about Chloe. When we finally did get answers, I still didn’t quite understand them…or at least I didn’t understand Chloe’s choices and reactions. And some of them never really got resolved (like they never talked about Shane’s new lifestyle). And while I felt like I connected with Shane a bit more, I just became concerned for him with the extreme guilt he still suffered from, and how it affected every interaction with Chloe and Wyatt. I was glad Wyatt encouraged therapy, b/c Shane needed it yo. I did feel a lot for what they had both gone through in the past, and how it was still affecting their current decisions…though a lot of that was leftover from the prequel. The problem is that the story ended up feeling really repetitive…they kept going over the same problems and not resolving them. It felt like a book that needed more meat, because it could have been trimmed down to a novella and the pacing probably would have been better. So quite honestly, the Shane and Chloe portion of this story was 3 stars at most. The extra half star all came down to Wyatt. I was surprised by his character, and the development I saw — particularly b/c I wasn’t a Wyatt fan in the prequel. But he really seemed to have grown, and I loved seeing him trying to help Shane and Chloe move forward as well. I also loved getting a look at sled hockey because of him…it added a bit of diversity to the story. The story ended solidly, and I loved the epilogue. But if I’m being honest, on the whole the story left me disappointed. Ah well.